Advanced oxidation processes (AOPs) attract increasing interest as promising powerful methods to efficiently removing non bio-degradable pollutants from contaminated water or soils. Thus, AOPs are environmentally friendly methods, which are based on the in-situ production of hydroxyl radicals ('OH) as the main oxidizing agent. Among the different approaches to generate the active oxidizing radicals, much attention has been devoted to the environmental applications of CDs in Fenton-based processes and phototreatments. The most popular chemical AOP is likely the Fenton method where a mixture of Fe2+ and H.O2 (Fenton's reagent) is used to degrade the pollutant into harmless products. The possibility of using CDs to promote the Fenton reactions was first reported by Lindsey et al. (2003). These authors studied the effect of native P-CD and CMCD on the effectiveness of the Fenton degradation of various HOCs (phenol, PAHs and polychlorinated biphenyls has been evaluated). The effectiveness of the process was found to be dependent both on the chemical nature of CD and pollutant. The best results were obtained for the degradation of PCB-80 (3,3',5,5'-tetrachlorobiphenyl) in the presence of CMCD, showing a 13-fold increase in the decontamination rate over the control experiment. It was assumed that, the CMCD could form a ternary supramolecular complex (pollutant-cyclodextrin-iron) and that the degradation of the pollutant in the complex would be enhanced by the proximity of the pollutant to the hydroxyl radical formation site. These complexes have been identified by electrospray-MS and by absorbance spectra. This pioneering work has led other researchers to investigate the destruction of toxic and refractory organic pollutants by means of Fenton-type processes assisted by CDs. Thus, an extension to this approach was recently reported by Matta et al. (2008) for the oxidation of 2,4,6-trinitrotoluene (TNT) by Fenton-like systems in the presence of naturally occurring iron-bearing minerals. In particular it was clearly shown that, at neutral pH, the combined used of magnetite-based systems (mixed Fen/Fem phase) and CMCD resulted in a threefold increase in the mineralization of TNT. Additional experiments have evidenced that CMCD increased the iron dissolution rates in aqueous phase by metal chelating and that this phenomenon was responsible for the enhancement of the degradation of TNT. The ability of CDs towards degradation of TNT by Photo-Fenton has been also explored in contaminated soil extract solutions (Yardin and Chiron 2006) . Photo-Fenton was carried out by applying UV light (l = 254 nm, 150 W) to the Fenton process. The use of 5 mM methylated-b-CD flushing solution showed the highest potential since the removal of TNT from soils was significantly enhanced. However, the catalytic methodology led to a modest improvement of the degradation rate of TNT. Accumulation of short-chain carboxylic acids, such as formic and oxalic acids, was detected during the mineralization process. Recently, Veignie et al. (2009) investigated the effect of native b- CD and its derivatives HPBCD and RAMEB on the solubilization of benzo[a]pyrene (BaP) and on its degradation by Fenton's reaction. Results showed that BaP apparent solubility and degradation was significantly increased in the presence of CD in the following order: b-CD < RAMEB < HPBCD. The effect of CD was further investigated to promote indirect electrochemical methodologies for the elimination of pesticides in soil. Indeed, Hanna et al. (2005) showed that HPBCD was an efficient flushing agent for treating pentachlorophenol (PCP) contaminated soil extract solutions by using electrochemically generated hydroxyl radicals via the presence of Fe3+ in the O2-saturated solution. A total disappearance of the pesticide and 90% abatement of the chemical oxygen demand were achieved after 11 h of electrolysis (I=200 mA). Gemeay et al. (2004) studied the oxidative degradation of thionine dye (3,7-diamino-phenothiazin-5-ylium acetate) in aqueous solutions, catalyzed by H2O2 and supported transition metal ion complexes for the treatment of industrial wastewater streams. A number of parameters were studied, showing that the degradation of the dye was strongly dependent on the nature of metal ion, ligand and support. The highest reaction rate was observed with the Ni(NH3)62+ complex supported on the Dowex-50 W cation-exchange resin with 8% divinylbenzene of cross-linkage degree. The effect of native b-CD on the oxidative degradation of thionine dye was also evaluated using Cu(NH-)42+/SiO2 as catalyst. When the amount of b-CD was too low (<0.5 mM), a significant inhibition of the catalytic activity was observed and this phenomenon was ascribed to the inclusion of the thionine in CD cavity, which would lead to a shielding of the dye molecule from attack by the oxidant. This limitation was partly circumvented with further increasing the b-CD loading (>0.5 mM). This rate enhancement was attributed to the formation of a 2/1 inclusion complex (b-CD/dye) complex or stabilization of the catalytically active species formed from the reaction between H2O2 and the catalyst. in the presence of potassium monopersulfate as the single-oxygen donor, the addition of HPBCD in the reaction medium allowed not only to enhance the mineralization of the pollutant, but also to substantially slow down the rate of self-degradation of the FeI II-porphyrin catalytic system thanks to the formation of a supramolecular complex with the oligosaccharide. Alternatively, Huang et al. (2003) developed the successful use of a b-CD covalently functionalized by an iron-porphyrin complex (hemin) for the degradation of toxic pollutants like Rhodamine B (RhB) and 2,4-dichlorophenol (DCP). This iron supramolecular complex was shown to be highly stable and active, with H2O2 and under visible irradiation, thus showing that RhB and DCP could be mineralized at 72% and 85% with low ratios of catalyst to substrate of 1:200 and 1:1,000, respectively. CD-assisted photodegradation of pesticides and environmental contaminants has been currently used for the destruction of organic compounds, under homogeneous or heterogeneous conditions and without any additional oxidizing agent. Kamiya et al. (1994) investigated the inclusion effect of a-, b- and g-CDs on the photodegradation rates of parathion and paraoxon and reported that the effectiveness of the process was strongly dependent on the nature of the CD. For instance, they found that g-CD resulted in a considerable inhibition on the photodegradation rates of the both pollutants while a-CD exerted a small promotion effect. Villaverde et al. (2007) studied the potential of native and functionalized CDs to act as photosensitizers for the degradation of the herbicide norflurazon (NFL) in soil colloidal suspensions and under irradiation. The irradiation was carried out with a Xenon lamp equipped with a permanent filter (1> 290 nm, 500 W/m2). In particular when methylated-, hydroxypropyl- and b-CD were added to the soil suspensions, the authors observed significant increases in the rate of NFL photodegradation, especially in the case of montmorillonite as shown by the measured t1/2 values (6.4, 5.3 and 4.6 vs 16.5 h without CD). This photocatalytic effect was connected to the ability of these CDs to form inclusion complexes with NFL according to following order: methylated-b-CD > HPBCD > b-CD > a-CD > g-CD. In a similar context, Wang et al. (2007) reported that the formation of 1/1 inclusion complex of bisphenol Z with b-CD allowed the enhancement of its aqueous photodegradation in the presence of b-CD under UV irradiation (l = 254 nm, 35 W). It was postulated that the enhancement effect by a factor 9 was connected to the moderate inclusion depth, facilitating the formation of 'OH radicals under irradiation thanks to the proximity of bisphenol with the secondary hydroxyl groups of the b-CD. Over the last decade, the use of photo-irradiated semiconductors as photocata-lysts, such as titanium dioxide in the anatase form, has also been examined for remediation processes. 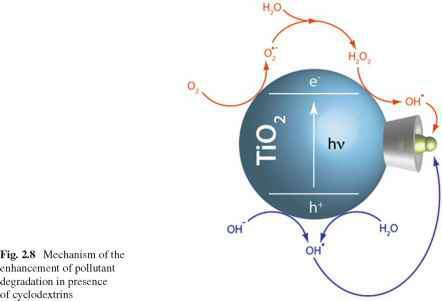 TiO2 has been intensively studied in the field of photocatalysis owing to its non-toxicity, low cost, high chemical stability and superior photoelec-tronic properties (Linsebigler et al. 1995). Notably, the possibility of coupling CDs and TiO2 in suspensions for enhancing environmental photocatalytic reactions was independently reported in 2004 by different authors (Anandan and Yoon 2004; Hanna et al. 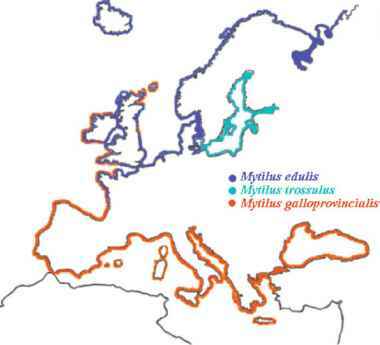 2004; Lu et al. 2004). UV-light (l = 254 nm, 30 W). The formation of surface complexes between the bCD and the dyes or Cr(VI) anions onto the TiO2 surface via hydrogen bonding and this hypothesis was supported by means of additional sorption and FTIR experiments. In these experiments, no degradation of b-CD was observed. Hanna et al. (2004) evaluated the behavior of native b-CD and HPBCD in the degradation of pentachlorophenol in contaminated soil extract solutions irradiated by a mercury medium UV pressure lamp (125 W) using TiO2 as a photocatalyst. However, the authors observed an inhibition of the photoactivity, which gradually increased with increasing amounts of CD. Nevertheless, by adjusting the experimental conditions, this method was considered as promising for the efficient PCP removal from contaminated soils, with preservation of the microbial activity. In the same time, Anandan and Yoon (2004) reported that TiO2-b-CD colloids prepared by hydrolysis of TiCl4 in aqueous 1% b-CD solution could be successfully used in the photocatalytic degradation of the Nile red dye carried out in the visible region with a xenon lamp (1> 320 nm). Near 70% Nile red conversion could be achieved after 1 h test in the presence of the TiO2-b-CD system and this value was about two times higher than that obtained in the same conditions with colloidal TiO2. Interestingly, the photodegradation of bisphenol A and analogues was further investigated in aqueous suspensions containing b-CD and TiO2 under irradiation in the visible region (1> 365 nm, 250 W) (Wang et al. 2006a, b; Zhang et al. 2009). Apart from the possible promotion of degradation of organic pollutants in aqueous medium, b-CD could play a role of "nanochannel" or "bridge" to improve the kinetics of charge transfer from the photoexcited TiO2 semiconductor to the electron acceptor groups of the organic guest retained in its cavity (Fig. 2.8). Interestingly, more sophisticated approaches involving the attachment of CDs to TiO2 surfaces have been performed. For instance, the ability of CMCD to be chemically anchored onto titanium dioxide has already been demonstrated. Thus, Tachikawa et al. (2006) reported that the amount of grafted CMCD onto the TiO2 particles could be five times higher than the value obtained with native b-CD. However, it should be emphasized that these CMCD/TiO2 particles facilitated the electron transfer in photocatalytic oxidation reactions of aromatic sulfides, studied by laser-flash photolysis. Toma et al. (2006) also showed that the surface modification of nanocrystalline TiO2 films with CMCD could be successfully employed to improve selective photodegradation reactions. According to these authors, the chemical anchorage of CMCD on TiO2 occurred through chelating of the carboxyl groups with the surface titanium ions. This new functionalized hybrid film has proven to be efficient in the UV-light photobleaching of a model guest organic species, i.e. [Fe(Brphtpy)2](PF6)2. It has also been reported that native CDs could be coated on the surface of anatase TiO2 particles under UV irradiation. Thus, Feng et al. (2005) reported that UV-light illumination of an aqueous mixture of T^ nanorods and native CD molecules (a-, b- or g-CD) in a pH range of 5-7 could result in the formation of self-assembly of photoactive hybrid nanowires of TiO2-CD, with lengths up to several millimeters. TEM data of the TiO2-CD indicated that the thickness of the organic layer between the TiO2 rods was about 1 nm. More recently, Zhang et al. (2010) have used a grafting procedure to anchor native b-CD on titanium dioxide through a photo-induced self assembly process. This method implied the UV-irradiation (l = 254 nm, 15 W) of the TiO2 suspension in the presence of b-CD under air bubbling. After 24 h under irradiation, the b-CD/TiO2 material was recovered by centrifugation and the solid particles carefully washed with water to remove the excess of CD. Tested in the degradation of paracetamol under visible irradiation, this new b-CD/TiO2 hybrid material led to a substantial increase of the photocatalytic activity compared to the control materials. The reusability was clearly demonstrated by three consecutive runs.